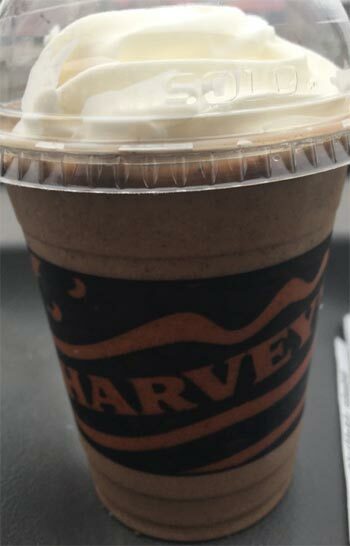 There is no description for the black forest cake milkshake on the menu, so I had no idea whether this actually contained black forest cake or if it was just a chocolate cherry milkshake. I felt ridiculous ordering just a milkshake through the drive-thru on January 2nd, so I added an order of deep-fried pickles. As I got up to the window I heard the girl behind the counter ask the drive-thru attendant, "what did this guy order?" "Pickles and a milkshake" "What kind of milkshake?" "Black Forest Cake" "oh my God, seriously!?" Now this really had me wondering why was she so upset with having to make this milkshake. It made me think there was more to this than just cherry syrup in a chocolate shake. Minutes later the girl returned with my gorgeous milkshake, dark like black forest cake with bright white creamy whipped cream on top. At first I couldn't tell if there were cake bits in it just by looking, but I realize the dark colour came from actual cake inside their regular light brown chocolate milkshake. On first sip, it tastes like a dark chocolate milkshake with the liquid from a cherry cordial in it and bits of cake and whipped cream. The milkshake gets a unique thickness from the cake bits and the whip cream on top adds to the entire experience. I managed to polish this thing off very quickly, it was oddly addictive. It tasted to me exactly how a slice of black forest cake from a diner mixed into a milkshake would taste. If you happen to be in Canada for the month of January, do yourself a favour and check one of these out. If you're not, make yourself a milkshake using chocolate ice cream, cherry cordials, chocolate cake and whipped cream. 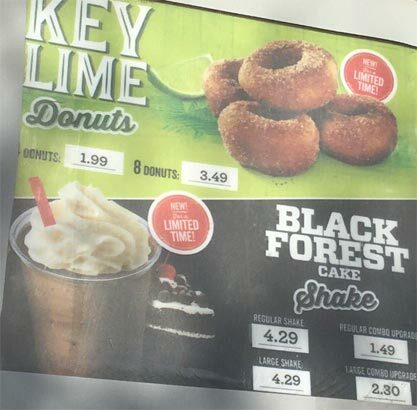 Yes, yes, YES!....I hope he tries the Key Lime donuts!!!!!! @Kaitlyn: for clarification, are you saying the texture is weird in general or that you through it in the freezer or are you just using the freezer as an example? Sorry, but it was a little hard to follow.